About 800 BC, the Phoenicians lived on the shores of the eastern Mediterranean. Their major cities were Tyre and Byblos, and they were merchants and sailors. They traveled all over the Mediterranean and Black Seas, establishing trading outposts and cities that bought goods and raw materials from local people, and sold luxuries like ivory and purple cloth. The purple cloth was their greatest luxury — no one else in the world knew the secret of making purple dye, and kings alone could wear the color because the Phoenicians made it so expensive. This was the origin of their name - "phoenix" in Greek means scarlet or dark red and was named after the famous dyes. The Phoenicians themselves had no real name, and because their writings are not common the Greek name has stuck. 3 What did they eat/drink? 7 What is their History? 8 What is left of them today? 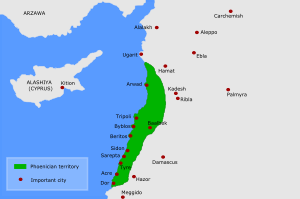 Phoenicia was a narrow strip of the Syrian coast, about 160 miles (260 kilometers) long and 20.2 miles (32.50875 kilometers) wide. The area now comprises Lebanon and parts of Syria and Israel. Their territory was so small that the Phoenicians were forced to turn to the sea for a living. They became the most skillful ship-builders and navigators of their time. The name Phoenicians means "purple people" because of the purple dye and purple cloth which only they could provide, an expensive dye they made from sea snails. They were known as skilled shipbuilders, and their innovative boat design allowed them to trade all over the Mediterranean. They were also excellent craftspeople. It is believed that glass was invented at Sidon, and the Phoenicians were known for their metalwork and faience (tin-glazed pottery). Because their goods were so prized by their trading partners, the states enjoyed good relations for many centuries. The buildings are similar to other middle eastern buildings - block shaped houses with small windows to keep out the heat and strong fortresses for defense. Because the Phoenicians traded all over the Mediterranean world, they ate very well. Their diet included olives, olive oil, wine, lamb, goat, cheese, garlic, honey, dried fish, soup, bread, watermelon, grapes, blueberries, and more. A huge variety of food from various cultures as a result of their trading ships. The Phoenicians wore many things that were purple. The purple dye they used was made from sea snails and expensive. The kings wore a lot of purple items because they wanted to show their high authority. They wore sandals, and loose tunic type clothing. The women wore their hair in intricately pinned to their head. Jewelry was also part of Phoenician fashion. A statue inscribed with Phoenician words. Phoenician writing is very similar in some ways to the Latin alphabet, because the Latin alphabet was designed, in part, from the Phoenician alphabet. In fact, the Phoenicians are the first known people to use an alphabet. Their writing system had 22 letters, which were all consonants. The reader had to guess at the vowels the author meant to use. One Phoenician city, Byblos, is thought to have been a major center for writing, because the city's name is the origin of the word "book"! Many scribes or professional writers worked in Byblos, and made copies of books there on Egyptian papyrus — an important trade product. The Phoenicians, most likely a Semitic people, spoke the Phoenician language. In addition to their many inscriptions, the Phoenicians, contrary to some reports, wrote many books that have not survived. Evangelical Preparation by Eusebius of Caesarea quotes extensively from Philo of Byblos and Sanchuniathon. Furthermore, the Phoenician Punic colonies of North Africa continued to be a source of knowledge about the Phoenicians. Saint Augustine knew at least a smattering of Punic and occasionally uses it to explain cognate words found in Hebrew. The name of his mother, Saint Monica, is said to be of Punic origin as well. Phoenicians had many gods and goddesses called Ba'lu and Ba'let. Ba'lu (Lord/Master) for men and Ba'let (Lady/Mistress) for women. They all worshiped the same major gods, but they may have different names in different cities. The temples were filled with priests, singers, musicians, divers, and scribes. Their sacrifices included fruits, oil and herbs. But also animals were sacrificed. From these things a variety of dishes were created for the gods. Two of the gods they worshiped were named Ba'lu Haddu (Lord of thunder) and Athtartu as he was the chief god and his consort. The Phoenicians took worship seriously and to prevent evil they would have ceremonies of dancing. The Phoenicians emerged around 1200 BC, when many other empires were being attacked by barbarians. They were able to become successful during the 400 years of Dark Ages that followed. Instead of creating an empire of land, these traders formed many trade links from a few independent cities on the coast of what is now Lebanon. They originally only traded with Egypt and Palestine because the Minoan people controlled the trade with Greece. However, once the Minoans were destroyed in the disaster of 1200 BC, the Phoenicians were able to expand their trade. The Phoenician homeland was in the center of the Ancient world, so they could trade with Egypt, Greece and the Middle East. By end of the Dark Ages in 900 BC, the Phoenicians were very rich. This made them targets especially by the Assyrian people. As they were attacked, they gradually established more colonies to the West, away from the plundering Assyrians. The most powerful of these colonies became Carthage and an empire in its own right once the Phoenician cities fell in this period. From then on, they were never as independent, being owned by Assyrians, Babylonians and Persians until Alexander the Great conquered them in 332 BC ending their independence forever. Their most significant contribution was the alphabet. It was the first original alphabet which the Greeks borrowed and changed and became similar to the one we use today. They are respected as great sailors and may have even discovered Britain and sailed around the African continent. This page was last edited on 4 April 2019, at 20:48.